Part one of our mid-season review looked forward to the Christmas games. Part two looked at what had happened up to New Year’s Day. As per yesterday, my reference points are comments I made in part two of our mid-season review. 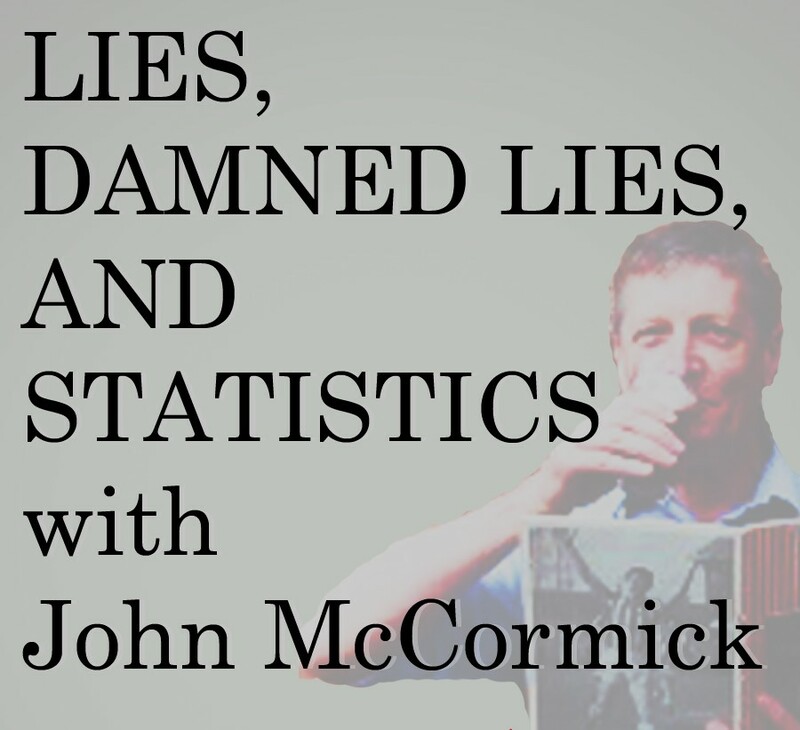 Reading it first if you have not yet done so might help to give today some context. …Our manager frequently mentions averaging two points per game. We’ve been doing that since October and still are, despite those dropped points. 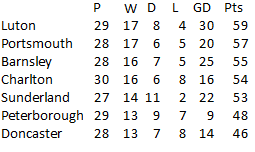 At New Year only Portsmouth and Sunderland had averages above 2 points per game. During the intervening months Luton were crossing and recrossing the two point line, and their fine win against Peterborough left them sitting on it. By the end of today Luton could be completely back on the right side (for them) of the 2 point barrier. Were we to win next week we’d be back to exactly 2 points per game. Draw or lose and we would drop below our current 1.96 into Charlton (averaging 1.83 goals per game) territory. Even so, Luton aren’t as far ahead of us as they might seem, as the graph below shows. It provides an alternative way of comparing the clubs on our original watch list* (Portsmouth, Peterborough, Charlton, Barnsley and Coventry**). I’ve set Sunderland’s points as the baseline and am showing the other clubs in relation to them. When Doncaster were doing well, some while ago now, they were added to the chart and some eight games ago, when it became obvious Luton weren’t going away, I added them as well. You’ll find Luton in the circled area to the top right of the chart. Adding the extra lines for Luton and Donny makes my graphs a bit messy, so I’ve enlarged that top right corner. While the League One table has had Luton ahead of us for the last eight games it works on points accumulated and effectively ignores the number of games clubs have played. 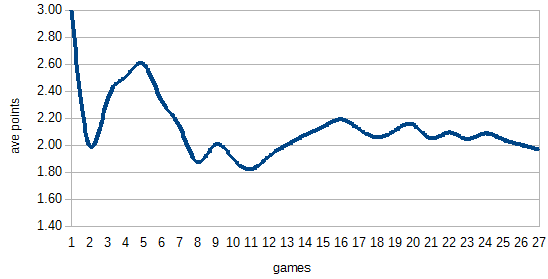 The starting point for my graph is the number of games played, not points at any particular time. 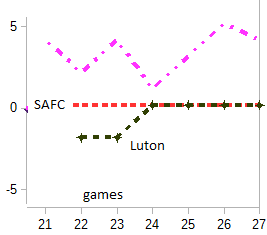 It shows that Luton have never had more points than Sunderland when they are compared on a game by game basis. Our game(s) in hand, and we know we can’t bank on it (them), has always given us the possibility of catching up. That possibility still exists but our propensity to draw means it’s now extremely tight and Luton’s propensity to score means their goal difference has improved, whereas ours hasn’t. That gives Luton the edge but neither team can afford to slip up. …this Christmas saw the beginnings of a breakaway group. It comprises Portsmouth, Luton and Sunderland, with Barnsley (who have a game in hand over Charlton) looking to recover enough ground to join them. There was a gap seperating the top five from Peterborough and Donny, which meant not only that Barnsley did catch up but that Charlton also did enough to stay with the breakaway group. However, Portsmouth, Luton and Doncaster each had a game in hand over Charlton while Barnsley and Sunderland had two. Remember Charlton’s points per game ratio of 1.83? That was quite a bit below the other clubs at the top, making it a tough call as to whether the breakaway really did comprise five clubs rather than four. Luton are now top and Barnsley have risen three places. Charlton began and ended the weekend in fourth place and the position of that gap didn’t change. So it looks like the only losers were Portsmouth, who dropped one place and Sunderland, who dropped two. I’d beg to differ, however. Sunderland and Portsmouth can regain their positions by winning their game in hand over Luton and Barnsley respectively. I’d rather have the points, but their situations are retrievable and Sunderland only need to draw one of three games in hand to pass Charlton on goal difference. My interpretation of Saturday’s results is that Charlton now have a massive task if they are to get into the top two, despite what has to be a decent result at Peterborough. Playoffs, yes, they are still there and neither Posh nor Donny (on the wrong side of that gap) can catch them by winning games in hand, but I just can’t see Charlton catching more than two of Luton, Portsmouth, Barnsley and Sunderland. Charlton fan A2c, who posted on Saturday, could argue that Charlton will benefit from the Portsmouth-Luton and Portsmouth-Barnsley games, and they will. But so will Sunderland, and Barnsley and Luton will be the ones to benefit in March and April, when Charlton and Sunderland come up against Portsmouth. Think about that. Portsmouth have yet to play every club currently in the top six, and so do Doncaster, starting with Portsmouth next Saturday. It’s not only results and fixtures that are interesting. I wrote that Luton had lost a manager while gaining a decent player from Barnsley, and that Sunderland’s top scorer had done a bunk. Since then Peterborough have sacked their manager and his assistant, replacing them with Darren Ferguson (appointed for the 3rd time) and Gavin Strachan. Furthermore, both Portsmouth and Doncaster, who are already games behind, have at least one more cup game to clog up their fixtures. Luton, Portsmouth, Sunderland, Barnsley, not necessarily in that order, plus Charlton hanging on to their coat-tails, will be the clubs battling for the top two spots at the end of February. Peterborough and Doncaster will remain out of it but will take enough points from some of the other five clubs to make life interesting. 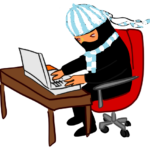 I’ll try to come back on Wednesday and I aim to return in early March with another look at what’s happening. And once again, before I go I must mention Coventry City**. They will finish the month with only four points from a possible fifteen. February includes some winnable games but I can’t see them doing us any favours when they travel to Kenilworth Road. Mid-table safety looks to be their destiny and I’m almost certain they won’t be returning to this series. But you never know, do you? That’s what football’s all about. Interesting article and much appreciated. 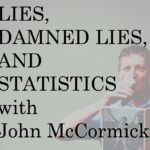 I’m a Luton Town fan – your analysis/insight is really interesting and a great read – thank you. I genuinely thought Luton finishing mid table this season and pushing on the next would be a a good season for us. What we’ve done so far this season is exceptional to be honest. Fingers crossed we continue our good form and Sunderland go up with us.